Recruiting at the University of Oregon has not always been a snap when it comes to getting the elite high school players in the country. The Ducks’ consistency in winning has been an effective recruiting tool; however, winning a first national title would help eliminate any doubt about how good Oregon really is. 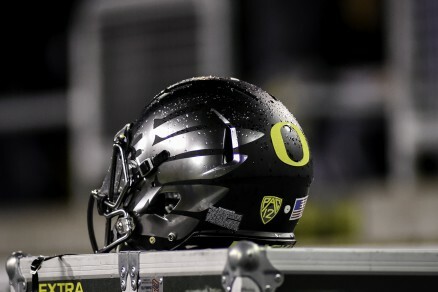 Oregon is making a name for itself around the nation with its uniforms, electric offense, amazing facilities and tendency to win 10 or more games each season, on a regular basis. The Ducks don’t back down to any major program that is willing to play them: LSU, Tennessee, Michigan State and Texas A&M to name a few. Never hurts to have a great cheering section. Oregon doesn’t always win the tough ones and won’t always get to play them (i.e. Texas A&M backing out of an arrangement recently). Playing these kinds of high-stake games is challenging on Pac-12 schools because they have only three non-conference games. So, losing to renowned teams before conference play puts more pressure on winning the conference games, to become bowl eligible. The way the Quackers have played this year has opened the eyes of many skeptics who didn’t think the offense could be effective enough to match up to physical defenses. The Ducks proved them all wrong by rushing for 173 yards and three touchdowns against Michigan State, 267 yards and four touchdowns against Stanford, and 269 yards rushing and two touchdowns against Utah. While the offense has impressed many, the defense has done pretty well at crucial moments, when it needed a stop or turnover. There has been the Joe Walker 99-yard fumble recovery for a touchdown to change momentum, and a 14-point deficit into a 7-7 tie against Utah. I watched from the stands when Eric Dargan jumped to intercept a Stanford throw on the Ducks one-yard line. Opportunities were created by the defense to give the ball back to the offense. If you think that high school recruits aren’t taking notice, you’re wrong! Looking at the 2016 class alone, there is only one committed player for Oregon who lives in the Pacific Northwest. The other two? A quarterback from Minnesota and a receiver from Tennessee. You can read how extreme Dillon Mitchell’s interest in Oregon is in my last article. Oregon keeps looking good in the games. The latest vote from the playoff committee has put Oregon at number two. Whoa! Are you kidding me? They jumped the defending national champs and undefeated Florida State Seminoles! Even the committee is noticing how well the Ducks look in their games, despite ongoing injuries. Oregon has a well-timed and deserved bye week before their final home game against Colorado. Fans might notice three prep stars in particular visiting when the Buffs come to Eugene. Each of them is being recruited for the defensive side of the ball. First, Byron Cowart, a stellar end, will travel from Florida. Next, Neville Gallimore, a powerful and stout tackle, will cross the border from Canada. Finally, Marquise Doherty, a likely safety, is making his way from Missouri. Gallimore is not considered a big lean for the Ducks either, but maybe the visit to Eugene will change his mind. His Crystal Ball on 247sports.com currently has Ohio State the leader for this big-time recruit. My hopes for Doherty are a bit higher because Oregon already has one of the top three Missouri football athletes. His skills would help the depth in the backfield. 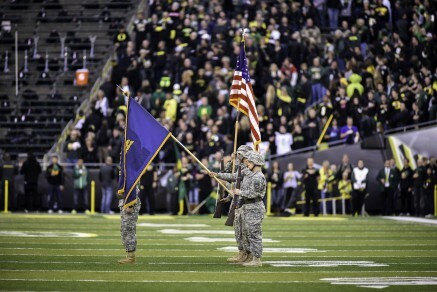 Celebrating Veteran’s Day — thankful for the troops for the country and the ones in yellow and green. The Colorado game isn’t going to be a highly anticipated game, like Stanford was, but it will allow the Ducks to showcase their talent. The talent can be built upon with the three official visits (hoping that number goes up within the next week or so) wanting to commit to Oregon. The Autzen crowd should witness another win for the Ducks. Speaking of the Stanford game, there were several prep visitors watching from the sidelines. Mitchell committed that weekend and made it public a few days later. Canton Kaumatule was giddy with his commitment that weekend, and by the potential of another commitment, which may be made by Drayton Carlberg at the end of this week. Who knows what other recruits were impressed with that visit. It may sway them toward Oregon for good, like Keisean Lucier-South, Semisi Uluave and Kirk Merritt. The Stanford win was huge. The Michigan State victory was huge. Beating Utah was huge. Winning out the regular season will be huge. Winning the conference championship game would be huge. Being selected in the top four to play in the inaugural NCCA playoff — and winning both games — would be crazy huge! 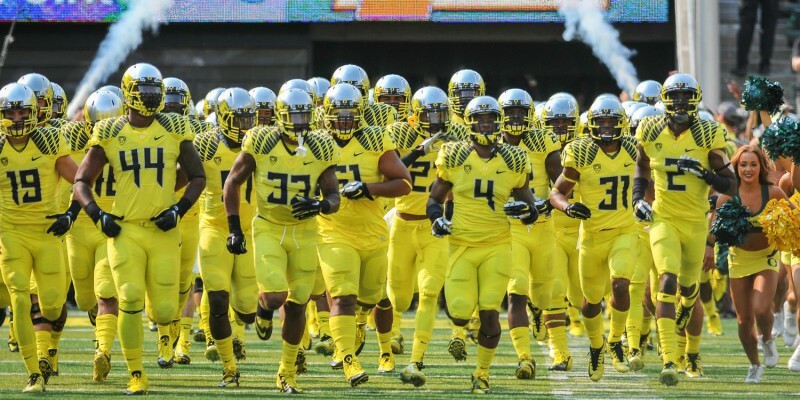 The recruits would flock and fight for a spot on Oregon’s roster. Oregon has done a great job consistently winning with 10 or more wins in each of the last six years, which is more than all the SEC schools but one (tied with Alabama). Winning from here on out will drastically improve the great image of Oregon football, and will help usher in an even better 2016 class than the top 20 class that the Ducks currently have.